Have any UK high street or challenger banks made the jump to 100% digital onboarding? The UK banking market has changed. Traditional banks are under threat from new, digital first challengers looking to shake up the status quo. Meanwhile, with PSD2 on the horizon and strict KYC and AML regulations in Europe, banks are under immense pressure to reduce fraud and ensure compliance. Customer demographics are also changing. For many consumers, digital is now expected, not a nice-to-have. With declining revenues and growing pressure to win new customers, banks must now cater for the digitally-native consumer. Despite the talk of digitisation, questions still remain. How digital is the UK banking landscape? Have any banks risen to these challenges? Are new entrants delivering on their digital promises? 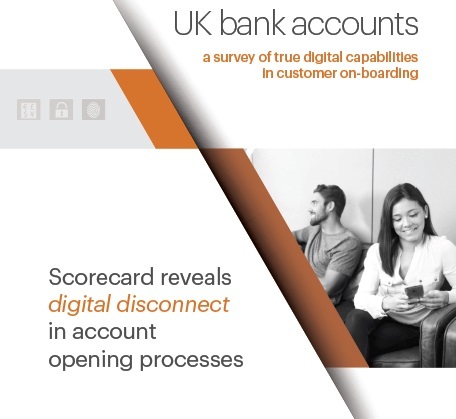 In this report, exclusively licensed by Mitek, John Devlin of P.A.ID Strategies explores these questions while scoring and ranking the UK’s leading high street banks and their challenger bank competitors, based on an evaluation of the digital account opening ID verification experience. Download this report by providing details below, to find out who are the leaders, and who are the laggards in fully digital onboarding. By downloading this report, you agree to share your details with Mitek. Assisting with the fight against cheque fraud and mobile enterprise digital transaction. Register for this live webinar, taking place on 20 June. US-based digital identity verification company bolsters its capabilities. DXE will use Mobile Verify solution to stay cool with compliance.